A shopping development granted planning consent last week is facing an unexpected hurdle after two objectors vowed to block the move. Last week, it was revealed that the town was set for a 200 strong jobs boost after North Lanarkshire Council agreed to allow L&S Broadwood to develop the Westfield based site, once earmarked for Morrison’s. Although the chain pulled out for financial reasons, the £25 million development will now be home to a seven-unit shopping parade which will include a Simply Food and Aldi. But bosses at Cumbernauld Centre and the Antonine Central say they’ll fight the move, as they believe that the process granting the application was flawed. 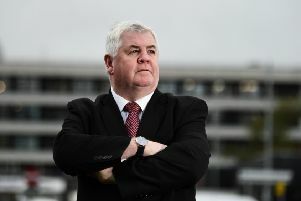 Stephen Hill, of Gatehouse Property Management which oversees Cumbernauld Centre, said: “The plans that were approved bear little resemblance to the outline submitted for a single food retailer. Zoe -Perreur Lloyd of Antonine Centre bosses London & Regional said: “This is particularly disappointing to us after we invested £40 million in the centre and kept faith with the town in the difficult years following the credit crunch. However, a third party has no right of appeal at council level and the move would need to be pursued through the courts. Meanwhile local councillor Bob Chadha criticised the resistance of the town centre to the plan. The Labour man said: “This is a trade-based objection to protect the profit margins of traders. “As far as the impact upon the Cumbernauld centre is concerned, the population in the whole of Cumbernauld is growing and the town centre will continue to flourish as it has shown before when Craigmarloch Tesco and other facilities were installed.